I do admit to leading a pretty charmed life. Sure, there have been highs and lows throughout, but the summer of 2012 has to be one of the best ever. I was high in every sense of the word that mid July night, sitting rooftop of our Hollywood apartment. We all were, having just gamed the California medical system by scoring some marijuana during our visit to Venice Beach. I was amazed at how easy it was and how openly corrupt the entire process appeared. 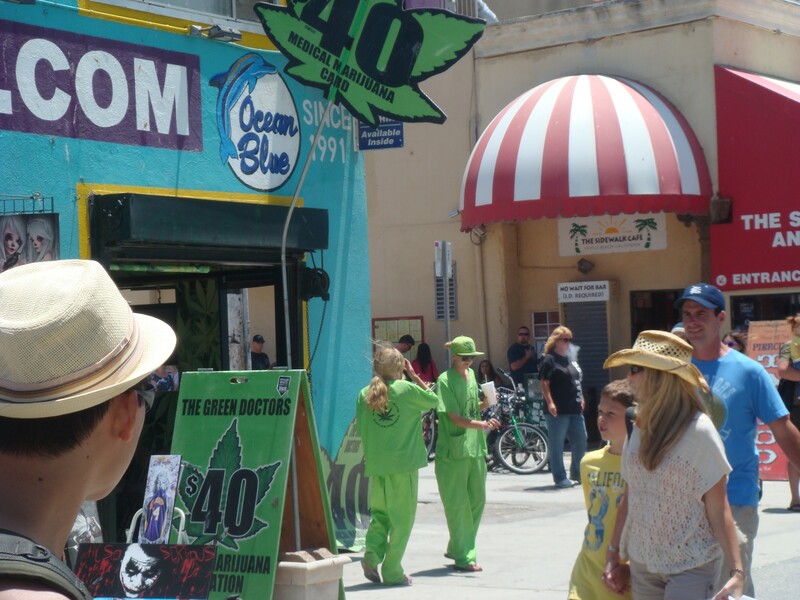 Marijuana doctors on duty in Venice Beach, California. But as we shared a puff of premium grade OG Kush, one thing was for sure. Nobody was hurting. The view from the roof was amazing at night. Smog circles drifting overhead, the lights of Griffith Observatory shining from the nearby hills and in the opposite direction stood the skyscrapers of downtown Los Angeles. Normen, Cheng Yew, Jastine and I went up to the top — with joints and beers — to indulge in our vices. Joel stayed in the apartment. Someone, after all, had to remain responsible. As twin brothers go, Normen and Jastine could not be more opposite. Jastine the steady, calculating planner, Normen the fashionable performing artist. I had gotten to know Jastine much better as we spent time discovering the Grand Canyon while he recuperated from a collapsed lung suffered upon arriving in America. I guess you could say we bonded over adversity. I, wounded ego, in self-imposed political exile and he a wounded stranger in a strange land. Normen worked at a different location so we rarely hung out, but he had the same job only at a much higher volume store. His shop, at Bright Angel Lodge, was right on the rim and he would work eight hour shifts — sometimes never stepping away from the cash register. Meanwhile, further into the village at Maswik Lodge, Cheng Yew and I would go hours without recording a sale. Based on those negotiating skills and his hipster looks, Normen became our point man for securing the weed. “That doctor was a joke,” he said, emerging from the Venice Beach “Green Doctors” office with prescription in hand. There were more medical marijuana operations in Southern California than McDonald’s, or at least it seemed. Green crosses, denoting clinics and dispensaries, were everywhere you turned. For a hick from North Florida and exchange students from Singapore, this was indeed a whole new world. “What I needed marijuana for,” Normen replied. Keep in mind, Normen is a picture of health. Young, firmly built and agile. He would never be mistaken for a cancer stricken patient or someone suffering from AIDS. The week before arriving in LA, he had hiked the Canyon, rim to rim during the height of the summer’s scorching heat. “And what did you tell him?,” Jastine asked. Just like that. We were all amazed. Of course, there was a catch. You paid forty bucks up front for the initial evaluation and after the doc cleared you, the next hurdle was finding the right pharmacy. As Normen quickly found, everyone had a hand out along the way. The dispensaries were protected like banks, only with meaner looking security. We all waited patiently as Normen went inside to select his “medicine.” He ended up with the OG Kush and Sativa and after dinner on our first night in LA, we passed the joint around and marveled at our surroundings. 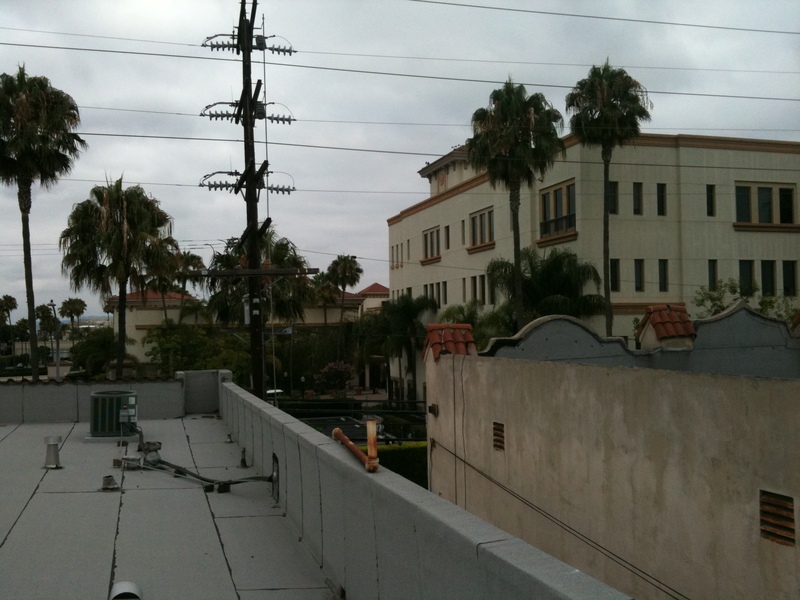 Our headquarters in Hollywood, California across the street from Paramount Pictures. The weed certainly helped my sunburn. I had gotten roasted pretty good at the beach, but the more I toked up the less pain I felt. This had been the first time in a long time, I had smoked marijuana. It was, without a doubt, available in the Canyon, but I never pursued it. I was intent on projecting leadership and didn’t want to fall in with the stoner crowd. But here, on a mini vaca in California, it was time to experiment. With each puff, I found the kush to make me a tad over analytical. Were those helicopters in the distance coming for us? Were they even there?? The kush hit Cheng Yew like a ton of bricks, so much so that Normen had to help him down the narrow flight of stairs back to the apartment. Jastine and I followed and eventually we all passed out. Insomnia cured. CA is so forward and backward all at the same time…. I love your last line – the irony and the humor.